At Autogate Supplies we are proud to be suppliers of CAME electric gates. CAME are one of the leading names in automated gate technology, and their products offer an unbeatable combination of performance, strength and durability. We have a variety of models available for you to choose from, which we have selected for their quality and the value for money they offer. What’s more, our competitive prices mean that buying a CAME electric gate kit needn’t cost a fortune – especially with free UK delivery on orders over £100. 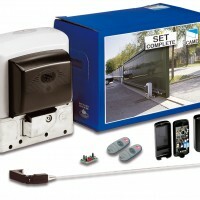 Shop now to see for yourself the quality on offer from CAME and Autogate Supplies.